This is a cross-post with iDigBio and authored by Austin Mast, Richard Carter, and Libby Ellwood. 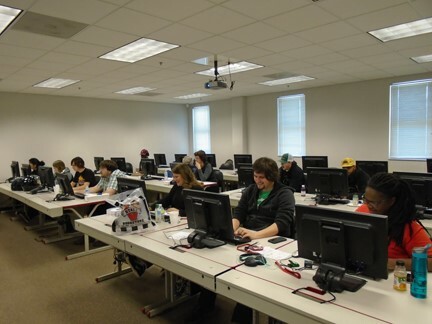 On Saturday, March 28, from 8–noon 31 volunteers gathered in computer labs at Valdosta State University (participants shown above) and Florida State University (participants shown to left) for a transcription blitz benefiting the VSU Herbarium and FSU’s Robert K. Godfrey Herbarium. The blitz used two online transcription platforms: Zooniverse’sNotes from Nature and the Botanical Society of Britain and Ireland’s Herbaria@home. In the end, 1748 transcriptions were completed—an average of 56 per person for the 4-hour event. This was the second in what is planned to be a series of digitization blitzes ocoordinated by iDigBio, the Southeastern Regional Network of Expertise and Collections Thematic Collections Network, and FSU’s Robert K. Godfrey Herbarium. The FSU images that were transcribed had been generated during the first of these, an imaging blitz in September 2014. 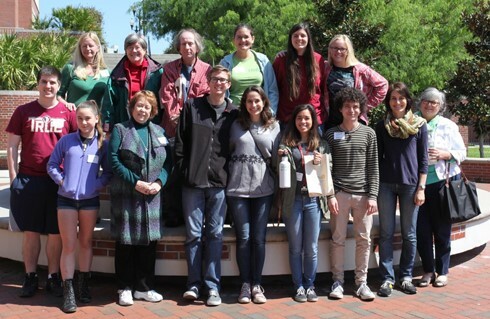 Prizes and event-branded thank-you gifts for the blitz were paid for by the contributors to the successful December 2014 crowdfunding campaign by FSU’s herbarium. Richard Carter (VSU), Austin Mast (FSU) and Libby Ellwood (FSU) served as local organizers. participants gained familiarity with the procedure, the organizers introduced one of four games that they used to prompt the participants to think more deeply about what they were seeing in the specimen images. 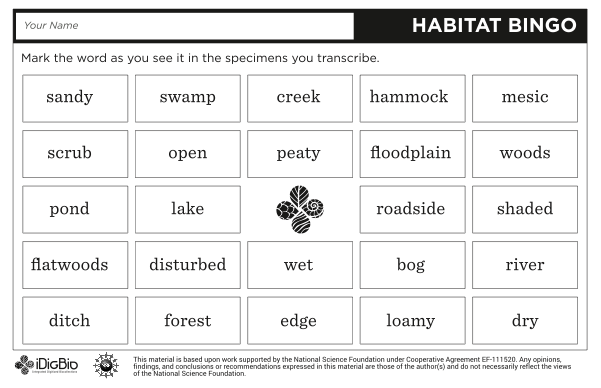 These games included Habitat Bingo (shown on right), Morphology Bingo, Timeline Tracker, and Geo Locator, which required participants to use habitat terms, morphology, collection dates, and collection localities, respectively. The organizers introduced a new game every hour, and small prizes were given out to multiple winners for each game. FSU also ran a raffle for a native blueberry plant, and transcribers received one raffle ticket for every five specimens transcribed. The remaining prizes were raffled off as well at the end of the event. Organizers provided a coffee break midway through the event. biodiversity research collections merit public funding; and 73% strongly agreed that they enjoyed the transcription blitz and would participate again. The most popular game was Geo Locator, with 87% finding it enjoyable or very enjoyable; each of the other games were enjoyed by 67% or more of the participants. Half of the FSU participants had not visited FSU’s Robert K. Godfrey Herbarium in the past; 67% had not transcribed specimen labels previously; and 67% had not previously participated in a citizen science project. VSU ran an informal post-event survey, and VSU’s participants particularly liked the bingo games. We do not yet have long-term data on the “stickiness” of the experience, but we know that at least two participants continued transcribing specimens online in the first 24 hours after the blitz. Organizers learned a few lessons with this first transcription blitz. First, the event produced progress in digitization for the herbaria and built community support for the collections. Second, the event was easier to host than FSU’s 2014 imaging blitz, since it only required access to computers and browser software to do the digitization on the day of the event, rather than relatively complicated imaging stations. Third, both transcription platforms were dependable—we engaged two in case of technical difficulties with one during the event (e.g., if high traffic led to a server crash). However, orienting the group to the second one mid-morning took time away from transcribing. It would be most efficient to just use one platform and hold the other as a backup. Fourth, the games were a high point for many of the participants and did not result in any drop in the rate of transcription relative to online, distributed participants. In fact, onsite participants had a higher rate of transcription. Herbarium transcriptions on Notes from Nature average 3.65 minutes per specimen when done by distributed participants, and, if one takes into account the 45 minutes used for orientation and break, onsite participants averaged 3.48 minutes per specimen. Fifth, orienting them to each new game took time away from transcribing. Two games played over a longer period would have fit more comfortably into the schedule. Sixth, a few subjects are critical for the training: the parts to a scientific name and what should be entered (e.g., should the author or varietal name be included), what an annotation label represents, how to identify the extent of a habitat description and a locality description, and the meaning of “s.n.” And finally, there is room for development of more structurd interactions between simultaneous events. The two computer labs were projected onto the screen (shown to right) and participants waved to each other, but otherwise activities at the two sites were independent of one another. Development of these cross-site interactions will become more important with the Worldwide Engagement for Digitization of Biocollections (WeDigBio) event planned for October 2015. WeDigBio has the goal of recruiting organizers for dozens of these events during a four-day period. The next transcription blitz at FSU will be in conjunction with the Florida Native Plant Society annual meeting on Friday, May 29, from 8–noon. Hi, are there any written notes from the training provided? E.g. for “how to identify the extent of a habitat description and a locality description”, I still don’t always feel that confident. I think the online game version is a superb idea. Let me pass it along to the folks who ran the blitz.